Mapua Heights Cottage is a comfortable and stylish two-bedroom holiday cottage with magnificent views. It offers privacy, space and the opportunity to relax in a stunning rural setting. It is just 5 minutes drive from Mapua, with its picturesque wharf, popular cafes and restaurants and unique shops and galleries. New Zealand art and sculpture feature in the cottage. A pot-belly stove keeps the whole cottage cosy in the winter, with a sturdy guard available if needed. 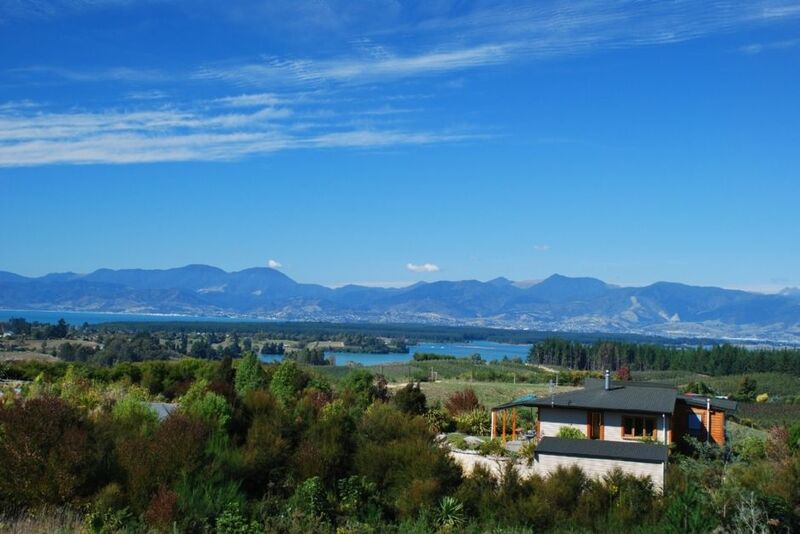 Our holiday cottage provides the ideal base from which to explore the Nelson-Tasman region. You may choose to enjoy the many beaches, sample the region's food and wine, visit the bustling Nelson Saturday market, tour the wineries and art outlets, have fun cycling, kayaking or walking in the area or tramping in one of the region's three National Parks. The possibilities are endless, hence many visitors choose to return. Too much choice? Owners Vivien and Ken are on site to ensure your comfort and provide local knowledge. * deer and sheep graze our paddocks - let us introduce you. We even have glow-worms in our gully - Ken is happy to be your guide! Nightly rate is for 1- 2 adults. Extra nightly charge for additional guests. DISCOUNT FOR EXTENDED STAYS OUTSIDE PEAK SEASON - PLEASE ENQUIRE. No additional cleaning charge, but we do appreciate the cottage being left in a clean and tidy condition. Stylish bathroom has a lovely wooden vanity with large mirror, shower over bath and washing machine. Eco-friendly toiletries provided. The cottage is in a stunning rural setting, yet just a few minutes drive from the welcoming village of Mapua. Panoramic views of sea, estuary and mountains. Pot-belly stove is cozy in winter. Additional heaters also provided. Beds made up with crisp cotton bed-linen. We favour natural materials for duvets and covers. Front-loader washing machine located in the bathroom. Clothes rack provided, or you are welcome to use our rotating washing line - we prefer natural (energy-efficient) drying in the Nelson sun. Car-port available for one car, alternative or extra shaded parking outside the cottage. Unlimited wifi internet. Good connectivity. Good quality towels provided for use in the cottage. You will find beach towels in the bathroom cupboard. Free wifi internet. Code provided on arrival. Traditional pot-belly stove with guard if needed. Wood supplied - all derived from our property. Tea, coffee and some kitchen basics supplied. Open-plan kitchen-dining area with generous table and four chairs. A small child's high chair is also available. The outside deck is also a beautiful spot for enjoying summer meals at any time of day. Small lawn area around the cottage, native plantings and plenty of birdlife. We loved our stay at the cottage. Handy location between Nelson and Mot, but really peaceful. Would definitely stay there again. Great location. Very nicely decorated and comfortable. Had a fantastic stay at this lovely batch. Had a fantastic stay at this lovely batch. Very clean and cosy in a great location. Felt very welcomed the minute we arrived and hosts gave us great tips and advice for things to do in the local area. Mapua Heights is a lovely property. Mapua Heights is a lovely property. It is modern, spacious and very clean and tidy. The location is superb with views over farmland and out to sea. Mapua Heights is very handy to Mapua itself and also close to wineries, cafes and local artists. Lovely cottage, beautiful location, very quiet and peaceful. Lovely cottage, beautiful location, very quiet and peaceful. Couldn't ask for anything more. Thanks Ken for your knowledge of the area and introducing our boys to your animals, beehives and glow worms. Family-friendly 'Animal Farm' 5 minutes drive from property. Several local wineries.